Diving packages we offer include both standard and custom diving packages. We are ready to create one to suit your interests. Miguel’s Diving offers diving packages with several hotels to suit the needs of guests. The star-rated Grand Q Hotel is considered the best in Gorontalo. Formerly, Quality Hotel was its name. The new owners are building new rooms, a swimming pool and a day spa. Also, we offer packages with New Melati Hotel for divers wanting to economize. We recommend its new Deluxe rooms. Pictures of these hotels and their rooms are available. Backpacker style accommodations are also available. Miguel’s Diving owns the only private dock in Gorontalo. This provides immediate and safe access to the ocean. The dive center is located in the Pabean neighborhood in Gorontalo City. Our address is Jalan Yos Sudarso No. 218A. Payment can be made in Indonesian rupiah or in US dollars. Exchange rates are available at this link. Local banks do not accept Euro, so we cannot. Also, local banks only accept new, unblemished USD100 bills. ATMs for cash withdrawals are widely available in Gorontalo City. Additionally, we often accept Visa and MasterCard. As a courtesy to you, there is no surcharge. Untuk penyelam nusantara, lebih gampang membayar melalui transfer ke rekening BCA kami. For single diver rate, please inquire. *Prices subject to change; please inquire directly. 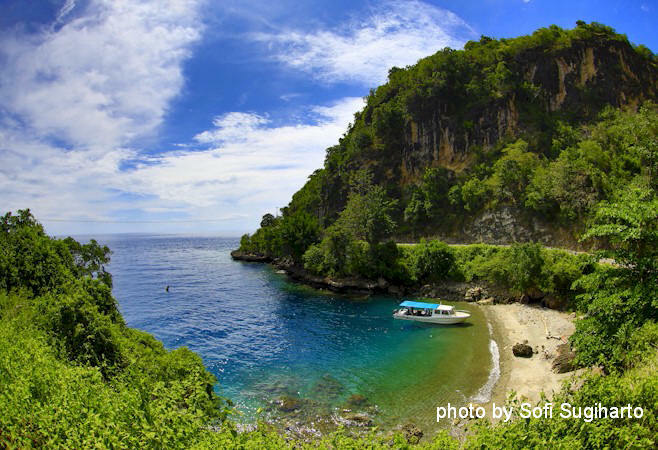 Diving season in Gorontalo is from November until April. Off season diving may be possible, but our diving schedule is limited and weather dependent. For dive equipment rental, guests should confirm sizes in advance. Divers will be expected to sign a liability release and assumption of risk statement in English, Indonesian, or Mandarin upon arrival and prior to diving. Divers will be expected to show their diving license to Miguel’s Diving staff upon check-in and prior to diving. Payment can be made in USD or Indonesian rupiah via bank transfer, cash or Visa/MasterCard. Credit card payment depends on telephone connection and electricity. These may or may not be available at the time of payment. Miguel’s Diving has no control over those issues. So, we reserve the right to ask for alternative payment method. USD cash must be in new, unmarked, unfolded USD100 bills. Unfortunately, those are the terms and conditions of local banks. They refuse anything else. Miguel’s Diving reserves the right to refuse smaller denomination bills or bills that do not meet these criteria. In that case, we will ask for an alternate payment method. Miguel’s Diving reserves the right to refuse to take a guest diving for a pre-paid activity if diving would increase the risk of accident. We ask for a minimum 12 hours notification of cancellation to avoid penalty. Non-swimmers are not allowed on the dive boat. Snorkelers can often accompany divers in their party. However, our schedule and site choices are determined for divers. A diver with a health disorder must bring a medical statement. Divers must secure their own travel and health insurance prior to departure from home. This includes evacuation insurance. The nearest recompression chamber is in Manado. Although some diving packages are built around existing flight or boat schedules, Miguel’s Diving is in no way responsible for changes in these schedules. The flying-after-diving interval on our packages is about 20 hours. Individual divers are responsible for communicating their onward travel plans and agreeing to a safe diving schedule.